Hi there everyone! I’m kind of giddy with today’s post because I get to feel like a bit of a fashionista. 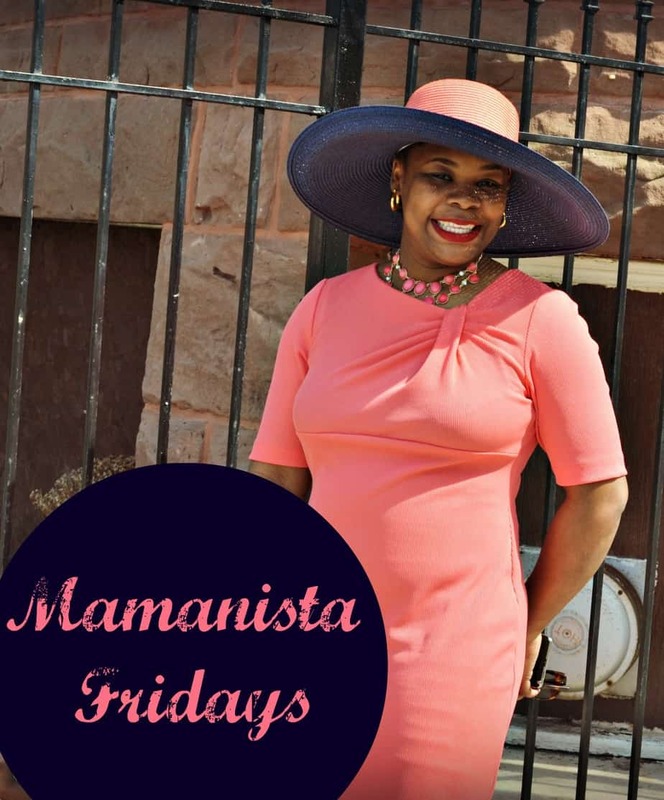 I’m linking up with BabyShopaholic and Mama Fashion Files today for Mamanista Fridays! I’m feeling quite fabulous in my coral and navy blue ensemble. I decided on these colors a long while back and began looking for things to sew all over. 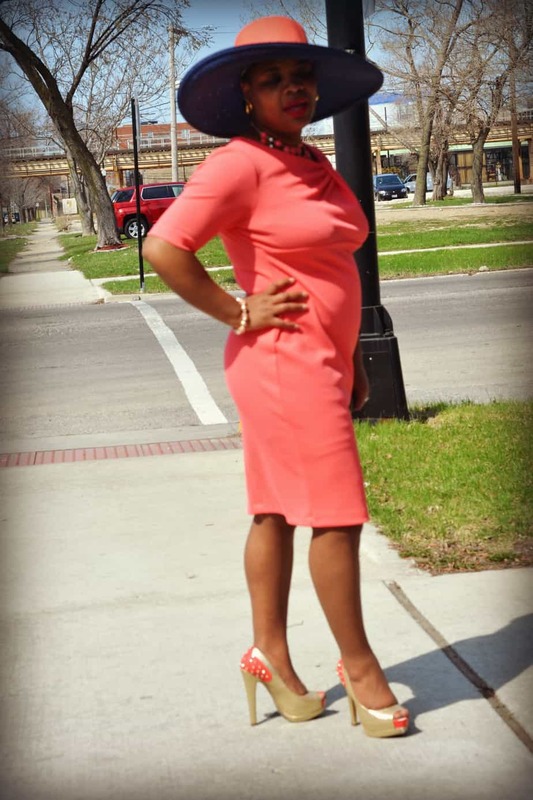 I actually sewed another outfit, but didn’t wear it because someone in the Houseful of Nicholes threw away the right shoe to a pair of coral sandals that I purchased. I can’t even talk about it for a long amount of time because I’ll get weepy. We won’t bother with acknowledging the fact that someone STILL can’t focus my camera properly. >sigh< Anyway, my MorMor baby purchased this dress for me as I had a meltdown of massive proportions about what shoe to wear with the prior outfit that I sewed up. I’m glad that she knows my style. How about his hat? I love it. It’s the right size of floppy and bendable. The crown is coral and the brim is navy blue. The young lady at my church who made it didn’t even have a swatch to use and nailed it! There’s something about being in an awesome outfit with a bold lip that gives me a bit of sass. I loved taking pictures after church out on the street. We saw lots of church mothers and little girls dressed to the nines! 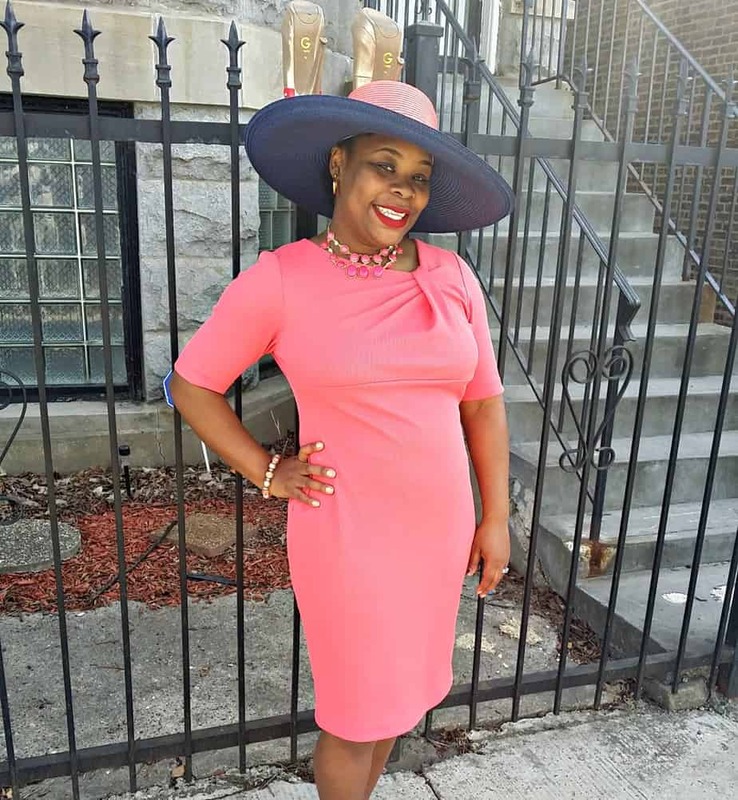 Easter is always the season of reflection of the Resurrection of our Saviour, but it definitely signals the start of the summer hat season in black churches! I don’t think that the hats are more important than my Saviour, but I can’t deny that there is something about a hat being worn with a sass. I’m pretty sure that this will be worn again before the summer is over, and then maybe I can get photos that are clear and bright enough for you all to see the details. I paired this look with a bold red lip, simple coral and gold jewelry and shoes. By the way, those heels are 4 3/4 high. Just the way that I like them. It’s a platform so it provides a lot more support than I expected, but even after wearing them for more than four hours, my feet were tired. They’re made by Guess and only cost me $1.99. You read that right. I paid less than two bucks for those babies. The dress is from Burlington Coat Factory, and I have no idea which brand it’s under. To be honest, I don’t care. It fits my personality to a “t.” Classic lines with a pop of color. Perfect combo for Mrs. Houseful. And Mr. Houseful couldn’t stop looking! There are of course lots of areas that I look at with my posing and figure I’ll do better next time, but today wasn’t it. We woke up, we worshipped and we came home to take photos. I had a great time in the Lord, and I presented my Sunday best. How was YOUR Easter? If you don’t celebrate the way that I do, I’m not against that, but I would like for any comments to be respectful! 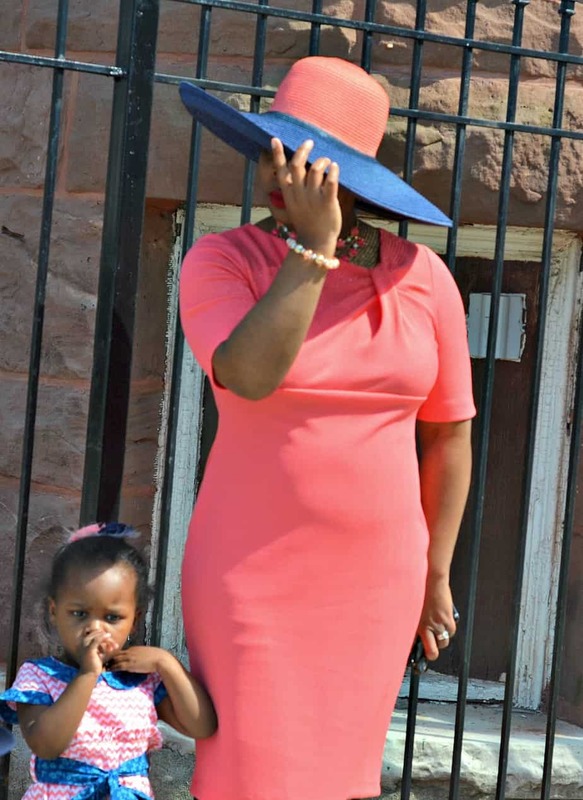 Visiting from Mamanista and you look Great in your coral & navy. I like your blog and will be back to read more. . .
YOU.DID.THAT! You worked it in that Hat! Thanks for linking up! What a great Easter look! Love the look and the hat is fabulous! Thanks for linking up! You look so beautiful!! Totally love that color on you!! Debbie Anthony liked this on Facebook. Elaine Springer Griffin liked this on Facebook. LeTroy Cooke liked this on Facebook. I would love to have a hat like this made! But i dont know where to go. 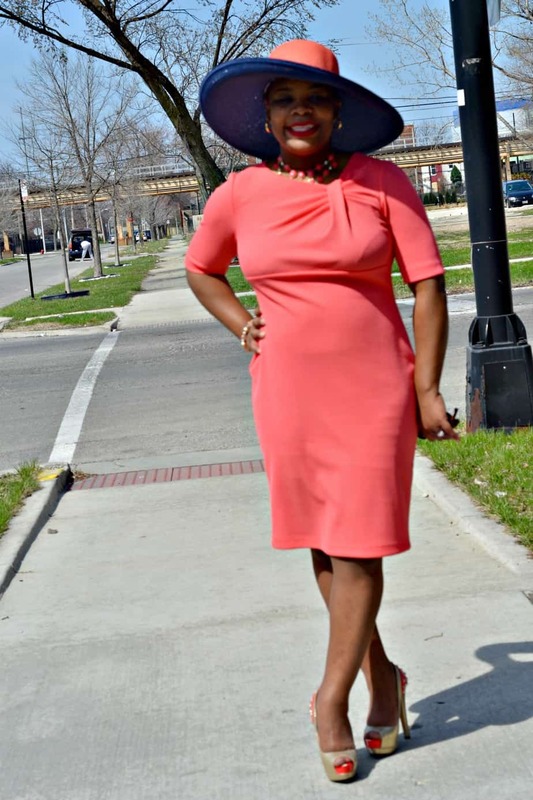 I have a coral dress too and im looking to add a lil pop to it!